Hello from Abilene, TX! I love to craft, especially sewing pet items. I have lived in Abilene almost all my life and raised, with my fantastic husband's help, two wonderful children here as well. Hello everyone! I've been crafting and creating things for years and am currently in love with dog collars and apparel! 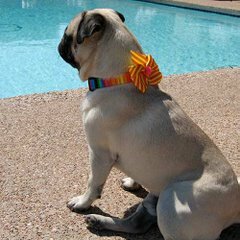 Every pet should have a colorful collar!